Celebrate your child's next birthday here at the Eilandarts Center. We offer unique themed parties for children of all ages that promotes creativity and fun. ​ Our parties are an hour and a half long, including a 45 minute activity lead by instructors from the Eilandarts Center and 45 minutes of free time. We only book one party at a time, meaning you will have our party space to yourself so that you and your guests can celebrate comfortably. Every child leaves the party with their own custom project (except for Toddler Tunes). All materials are included. This party rocks! We will sing, dance, clap, and tap. If your child loves music, this party is sure to be a smash hit. In this party, kids will dip their hands in paint and leave a handprint on the wall. They will also get to make a footprint which they will use as a base to paint either a lady bug, butterfly, or bumble bee. Ooey gooey fun! In this party, we will make different types of slime for everyone to take home. 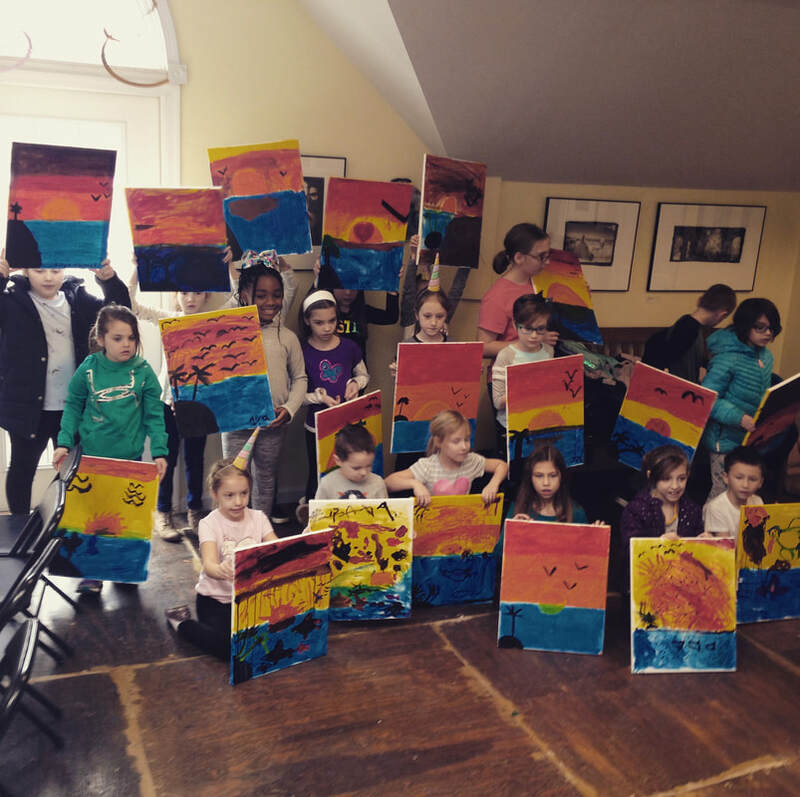 With our instructor, kids will paint their own master piece on a canvas. Minecraft Painting Party: Calling all Minecraft lovers! Kids will choose a Minecraft skin and paint it. They can make a self portrait or let their imagination run wild and paint it however they please. Using real fruits and veggies, kids will learn how to make prints. We will cut the produce in half, paint them, and make stamps. It's slime time! Party guests will help us as we conduct super cool science experiments. 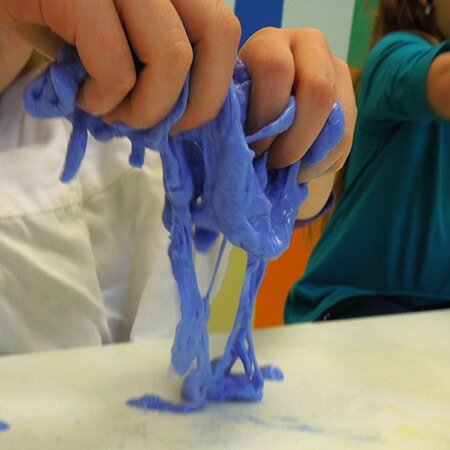 The best part is, kids will get to take home the slime they create. 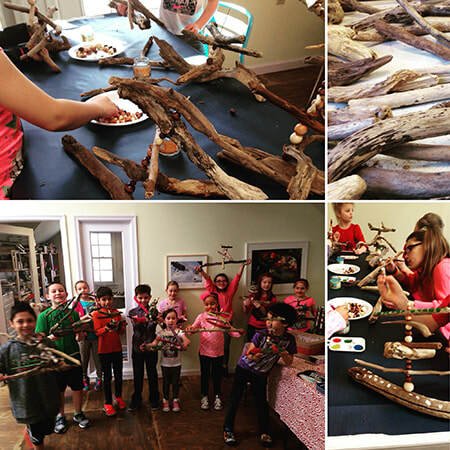 Using driftwood and beads, kids will paint and create their own sculpture to take home. This activity is surprisingly simple, but the end result is beautiful. In one hour you and your party guest will turn into a rock band! Get ready to play the drums and sing as loud as you can! Catering options are available from The Station Coffee or you are welcome to bring your own food, drinks, and cake. Already a slime expert? Try your hand at trickier slimes like glow in the dark. We will provide all the necessary ingredients and have guests try and create their own secret slime recipe. In this party, kids will create a themed collage using pictures, magazine cut-outs, construction paper, and everything in between. This party is great for imaginative children. Using everything from feathers to paper, we will make magic little houses for fairies to live in. Kids will get to take their creation home so that their fairy friends can rest comfortably wherever they go! Enjoy a bar filled with sprinkles and decorations. They will learn how to pipe a cupcake or sugar cookie and than be able to decorate their own. each kids gets 5 cupcakes (or 6 sugar cookies).